Did you know that there are specific foods you can eat to lower cholesterol? I love hamburgers and pizza just as much as anybody, but I know they aren’t great for my cholesterol. Making slight alterations to how you eat some of your favorite foods can lead to lower, healthier cholesterol levels and slash your risk of a cardiac episode. For example, by choosing leaner cuts of meat for your burgers, using a whole-grain bun, and eating more vegetables, you can cut cholesterol by 25% or more. And lowering your intake of processed foods will reduce it even further. If you’ve got high cholesterol, you’re at an increased risk for heart disease—there’s really no way around it. You can pop pills every morning to deal with it, or you can do something better: eat your way to lower cholesterol. The choice is yours. 1. Eating healthy fats: This includes healthy unsaturated fats such as olive oil, vegetable oil, oily fish, nuts, seeds, and nut butters, which provide you with healthy HDL cholesterol to help prevent clogged arteries and lower the risk of heart disease. 2. Swapping fatty cuts for lean cuts: Although it’s been determined that cholesterol from animal sources is neutral and likely doesn’t pose the cardiovascular risks that it’s long been associated with, it won’t hurt to opt for leaner cuts of meat, which are flavorful and widely available in grocery stores. You can save some calories by swapping high-fat cuts of ground beef and steak for leaner options, such as flank steak, sirloin, and 96% lean beef. Game meats such as bison and wild boar are also very lean, and so are more common options such as turkey breast and chicken breast. 3. 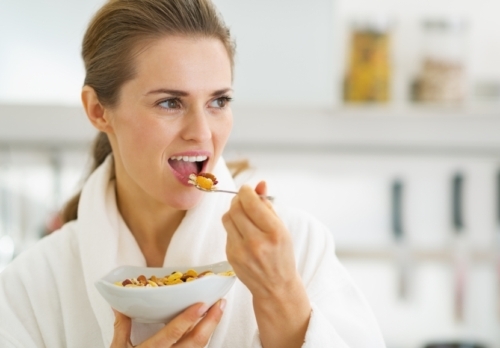 Eating fiber: I love eating oatmeal, and sometimes I have it as a late-night snack. You can add nuts, fruit, and cinnamon to it for great flavor and added nutrition, but one of the biggest benefits of oats is its soluble fiber. Soluble fiber can lower cholesterol by removing LDL cholesterol from your body. 4. Eating plants: Most plants are filled with fiber and other nutrients that can help lower cholesterol and promote heart health. Plant sterols and stanols are great at this because chemically they have very similar structures to cholesterol and they stop the body from absorbing it. To get even more in your diet, there are a number of products that are fortified with these nutrients such as spreads, juices, and yogurts. 5. Limiting processed foods: Processed foods are high in refined carbohydrates that lead to an LDL buildup along arterial walls. By switching to whole-grain bread sources and other such options (which, by the way, are also higher in fiber), you can lower cholesterol. If you want to keep your cholesterol in check, you don’t necessarily have to adopt a restrictive, low-calorie diet. Instead, make a few changes to how you shop and eat to make substantial improvements in cholesterol level and heart health. Chowdhury, R., et al., “Association of dietary, circulating and supplement fatty acids with coronary risk,” Annals of Internal Medicine web site, March 19, 2014; http://annals.org/article.aspx?articleid=1846638 , last accessed April 6, 2016. Aubrey, A., “Don’t fear the fat: experts question saturated fat guidelines,” NPR web site, March 17, 2014; http://www.npr.org/sections/thesalt/2014/03/17/290846811/dont-fear-the-fat-experts-question-saturated-fat-guidelines , last accessed April 6, 2016.